Hi, I am interested in your 1966 Chevrolet Nova (stock #4664-ATL) listed on Autotrader for $41,995. I'd like to get more information about this vehicle and confirm its availability. Its no mere rebadging of a more commonly seen representative of the model. 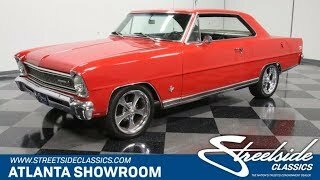 This 1966 Chevrolet Chevy II Nova SS is the real thing - a genuine top tier example of the Nova, Chevrolets original entrant into the muscle car war of the mid-60s. It retains an authentic appearance thats electrified by a set of ultra sharp aftermarket wheels and its been equipped with a well-chosen array of upgrades to make it a great frequent driver. The red shade draped over its first generation form is a definite winner. Its bright and vibrant with a great shine from front to back. Get up close and youll notice right away just how precise the panel alignment is - when you trace the contours that run the entire length of the car, youll see theyre very level the whole way. The stock stance combines with a collection of proper badging that all remains securely in place and proudly proclaims this Chevys upper class status. The collection of chrome on board here is also looking strong - the front and rear bumpers both sit nice and level and show no signs of any mishaps, and a polishing session will have the body trim looking its best in no time. Clean, clear glass surrounding the cabin adds further to this classics road-ready appearance - this is a strong, solid ride in all respects and it really looks the part. Inside, the interior remains in its original black color and now sports some great upgrades to increase its functionality. The front buckets show only the slightest of wear as they straddle a center console that blends a stock foundation with aftermarket add-ons to great effect - the cupholders and storage space will really come in handy. Some really nice work was performed on the instrument cluster - the added Dakota Digital gauge pack mixes in some analog elements and really looks great in this setting. A sharp-looking billet steering wheel now sits on the tilt column, and just to its right, the underdash climate control system will keep you and your passengers comfortable while the AM/FM/CD stereo tends to your audio requests. In back, the trunk area is as tidy as can be, with clean carpeting lining the floor and a full size spare in view wearing a matching cover bearing the signature Chevy bowtie - a nice finishing detail. Plenty of attention has been lavished upon the entire drivetrain to bring it to top form. A fresh 5.7 liter crate motor now sits in the engine compartment. It was added not long ago and is armed with a JEGS aluminum intake manifold and 4 barrel carb that sits under a distinctive Holley dual element air cleaner. The 4 speed automatic 700r4 transmission just behind it was recently rebuilt and offers an overdrive gear to keep revs down at highway speeds. Rounding out the drivetrain is a 10 bolt rear end that now carries a new set of gears. Theres a great collection of chrome components under the hood to add eye candy and a sizable aluminum radiator sits up front to keep temperatures in check. The aftermarket front suspension provides a ride quality that is nice and firm yet plenty comfortable. Power steering makes for easy navigation, while power brakes that feature discs up front bring this classic Nova to prompt and fade resistant stops as it cruises on its set of very cool looking 17 Ridler wheels wrapped with Ironman tires. This 1966 Chevrolet Chevy II Nova SS features a blend of vintage charm and modern functionality thats hard to come by. Call today!